This nest with beautiful blue eggs was being tended by a catbird in my wild rugosa rose bushes. 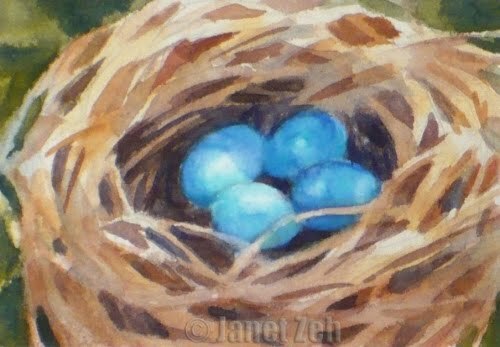 Some of you who are very observant will notice that for the eggs, I had to add a turquoise blue to my primary palette. Without it, that gorgeous blue color could not have been acheived. So this one is done with four colors rather than three. One red, one yellow and two blues. The original has been sold, but check for more of my art in my Etsy shop, JanetZeh.Etsy.com. Thanks and have a beautiful day! Clever strategy Janet! It pays to break the rules sometimes!